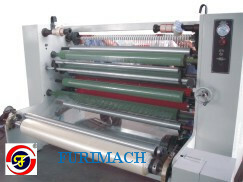 Suitable for slitting BOPP tape, stationery tape, etc. 2. 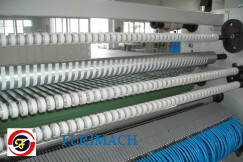 PLC control system with touch panel operation. 3. 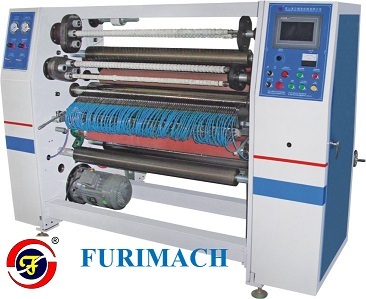 Automatic shaft exchange: once the rewinding operation is finished, the machine will automatically perform shaft exchanges for convenient and efficient operations. 4. The banana roller is used to eliminate tape wrinkles during extension and feeding. 5. Air blades: this unit is fitted with 3" air blades, permitting the slitting of a variety of tapes. The knife positions can be adjusted in left/right directions and the pressure of the air blades can be adjusted to suit tape material variation. 6. Spool trim winder is used for edge trimming collect and if tape gets broken during running, machine will auto stop.